If you ever visit Italy, put this place place on your list. 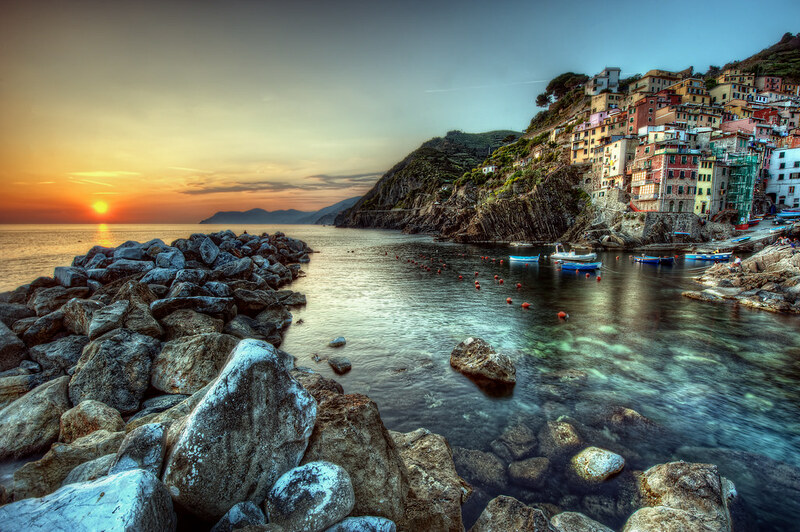 This is Cinque Terre during a beautiful sunset. Cinque Terre literally means "Five Lands", and is a section of the Italian coast containing five different villages, all with a beautiful, colorful style architecture which you can see here. This photo here is from the very first town, Riomaggiore. If you do make it Cinque Terre one day, I would recommend staying for the night as the sunsets can be beautiful. We did not stay the night, and this picture was taken just minutes before the last train back to Florence left, so I didn't get to see this place in blue hour but I can only imagine the beauty of this place during that time. I got a great deal of satisfaction from taking this photo because these rocks were not easy to climb one handed while holding a very heavy camera rig. I was quite impressed with myself. Beautiful shot man. Im heading to the Italian coast in a few weeks and this got me even more pumped! Thanks Jesse! You will love it and the weather will be amazing. Where you headed? What a stunning shot! Nice job. Matty this is absolutely beautiful - I was in Amalfi in 2006 and it looks a bit like this...dying to go back. What an incredible shot. Going out tio Italy for the first time in 2 weeks and this place is on the itinerary. Hope it as beautiful as you have caught it. I was in Cinque Terre last year at the time. What an amazingly beautiful place. I was not into photography back then like I am now, especially with HDR. I'm jealous of this picture!!!! Amazing job. I need to retravel Europe just to HDR it! to me, this is the last town. i lived in genova for two years and i was probably there when you were here.